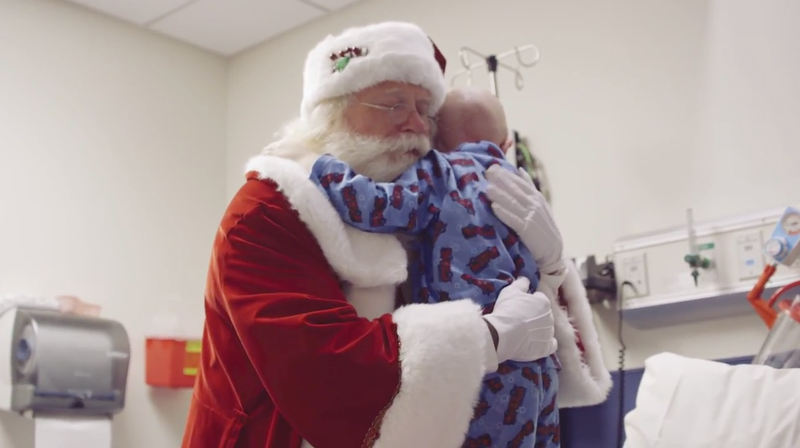 Santa Claus ditches it entirely in Expedia's touching Christmas campaign from 180LA, choosing instead to fly coach around the world and ending up at St. Jude Children's Research Hospital in Memphis, Tenn., where he delivers presents to some very special kids. As seen in the video below, Santa traveled 19,602 miles over seven days (49.7 hours of flight time), going from the North Pole via Anchorage, Alaska, through Honolulu, Tokyo, Dubai, Paris, Dublin, New York and finally to Memphis, where he hands out gifts—and also donates all the points he earned on flights to St. Jude, which is the selling point here. "Santa flies around the world every year for children, so we loved the connection of giving him travel points to donate to St. Jude Children's Research Hospital," says Vic Walia, senior director of brand marketing at Expedia. "More people travel during the holidays than any other time of year. We hope this campaign will encourage people to donate their Expedia+ rewards points to St. Jude, considering how quickly they can add up during this busy travel season." More at Expedia.com/Santa and the hashtag #SantaFliesCoach.